If you like to stray for the traditional pepperoni or sausage pizza this is definitely a recipe to try. It was fabulous! I have still been searching for a pizza crust recipe that I can throw together the day I want pizza, and think I finally found one. 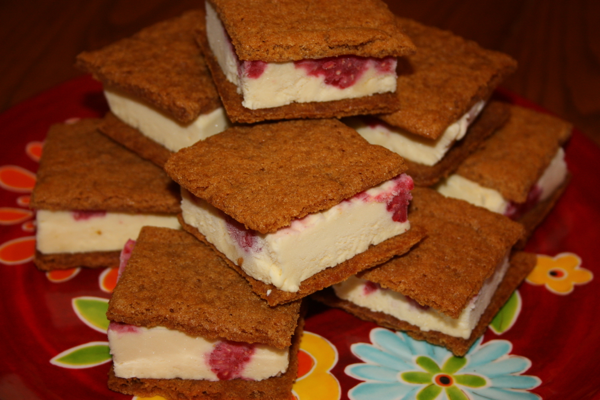 (I have several recipes that I like, but most of my favorites involve making the crust or at least part well in advance–though not with this one.) I once again found this recipe from the baking book I checked out from the library. It was super easy and it came together in a reasonable amount of time. I also really liked that I didn’t have to par-bake my crust and was able to assemble and throw it in the oven and about 6 minutes later I had pizza. The other thing I really liked about the crust was that it made two 12-inch pizzas which was perfect for my family. I made a traditional pepperoni pizza for the boys and Jeffrey and I had the fancy version. The inspiration for this pizza came from the pizzeria Jeffrey and I ate at in San Francisco with some friends of ours from college. We actually ordered three different types of pizza at the restaurant, but this is the first to be replicated at home. Now that I found a crust that I like that can be thrown together the day I want pizza, I will be on the task of figuring out how to recreate the other pizzas. 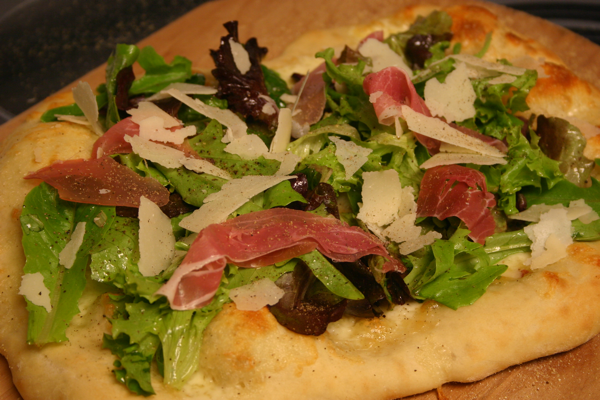 Like I said before, this pizza with prosciutto and mixed greens is fabulous. We even got William to take a few bites. Jeffrey and I really enjoyed the contrast between the cool salad on top and the warm cheesy crust. Yum! Just writing about it makes me wish I had one in the oven. This will definitely be on the rotation at my house this summer. 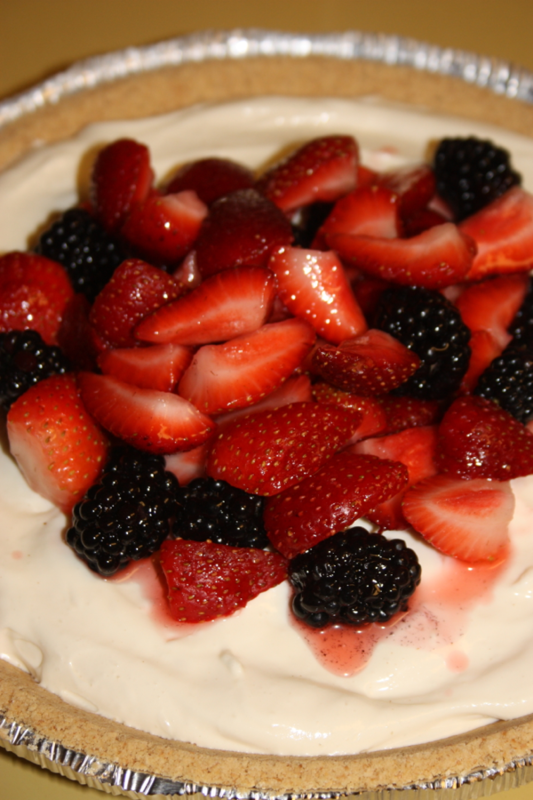 What are some meals that you enjoy during the summer? 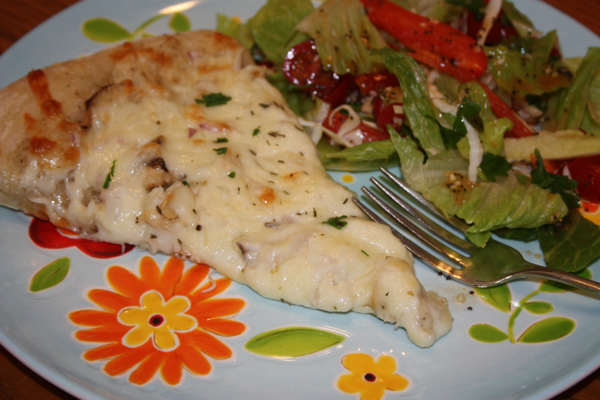 Sprinkle the fontina cheese evenly over the prepared pizza dough, leaving a 1/2-inch border. 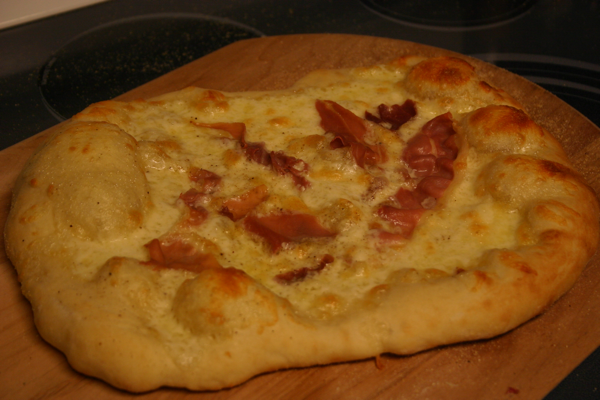 Tear one or two of the prosciutto slices and arrange on top of the pizza. Bake for 6-9 minutes or until the dough is a nice golden brown. Toss your mixed greens and basil on top of the vinaigrette. Toss together until the greens have been evenly coated. Cover the top of the baked pizza with the salad. Top with an additional slice or two of prosciutto and shaved parmesan cheese. Season the top with freshly ground black pepper. Pour the 1/4 cup warm water and yeast into the bowl of a stand mixer. Whisk by hand to blend. Let the mixture sit for 5-10 minutes. After the mixture has rested and the yeast is activated whisk in the 1 cup of water and 3 tablespoons olive oil. Add the flour and salt. Knead the dough using the dough attachment on the mixer on low speed for about 2 minutes (it will come together in a cohesive mass). Cover the bowl with plastic wrap and let the dough rest for 20 minutes. (This allows the dough to fully hydrate.) After the rest period, turn the mixer to medium-low and knead until the dough is elastic an smooth about 3-6 minutes. Lightly spray a large bowl with non-stick cooking spray. Scrape the dough out of the mixer and into the prepared bowl. Turn the dough over to oil the top. Cover with plastic wrap and let the dough rise at room temperature until doubled in size. This should take about 1 hour depending on the temperature of your kitchen. Place a pizza stone on the middle rack of your oven. Preheat the oven to 500 degrees. Allow 30 minutes to 1 hour to insure the stone has heated properly. Dust the top of the dough lightly with flour, then press down using your hand or a rolling pin to flatten the dough into a disk about 12 inches in diameter. Dust a pizza peel (or baking sheet) with corn meal to make transferring the dough to the stone easier. Top with your toppings of choice. Transfer the pizza to the hot stone using the sheet pan or pizza peel. Bake for 6-9 minutes. When the pizza is finished cooking remove the pizza using a large spatula, sheet pan, or pizza peel transfer to a cutting board, slice, and enjoy.